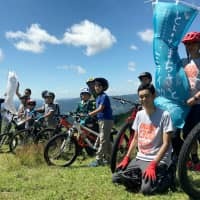 An ongoing project to create employment opportunities in the depopulated Inabu district of Toyota, Aichi Prefecture, is beginning to bear fruit, as a college student and two other people accepted job offers of working five days a week — three at a local factory and two as mountain biking guides. The Inabu Base Project, launched by some mountain-bike lovers from Aichi and local car seat cover manufacturer Toyotake Industry Co., aims to revitalize the mountainous district of Inabu by establishing mountain biking trails to attract tourists and creating job opportunities by hiring tour guides. They plan to start bike tours in April. Hayate Endo, 22, of Kawagoe, Saitama Prefecture, is the first college student who will be employed by Toyotake under the project. 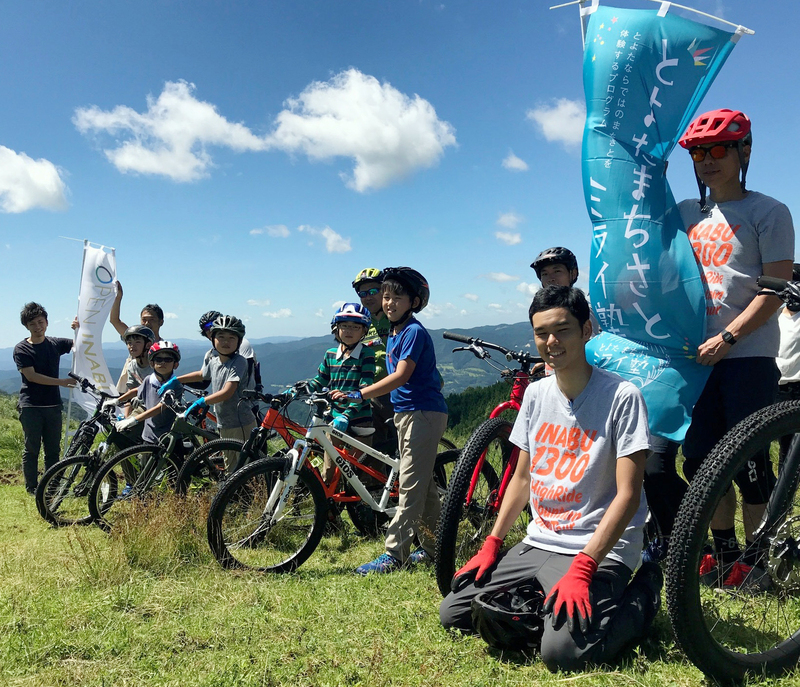 At the end of August, Endo helped out during a mountain biking lesson attended by five elementary school children, which was held on a grassy plateau in Inabu, about 1,200 meters above sea level, overlooking the Central Alps, which are also known as the Kiso Mountains. The event, organized by the Toyota Municipal Government, gave Endo his first chance to work as a guide. Then one day in early July, he got on a night bus to visit Inabu to participate in the project and look for potential mountain bike trails. He said he had been worried whether his love for cycling would be enough to enable him to get along with the locals of a mountainous village where he was a complete stranger. But his worries gradually disappeared as he worked with people devoted to the project and experienced an internship at Toyotake the following day. On the night of the internship, Toyotake President Koshiro Yokota, 43, said to him: “How about challenging yourself to something new in Inabu?” Endo accepted the offer without hesitation. One of the trails, built on privately owned land, was shown to the public in March and Yokota said he was surprised by the unexpected high amount of attention it received. In addition to Endo, Takao Tsuchimoto, 28, who currently works at a bicycle shop in Owariasahi in the prefecture, and Robert Schwietzer, 34, a German who moved to the district after marrying a local Inabu girl, are expected to join the company under the project. Although some problems remain, such as the lack of an established system within the company to train guides and the shortage of housing for rent in the area, the people of Inabu pin high hopes on the project which could bring in young people to the district, whose population dropped more than 20 percent in the last decade to about 2,300. There are many things to be done before starting the tours, including expanding trail routes and renovating a closed school building to use as a base for the tours. This section features topics and issues from the Chubu region covered by the Chunichi Shimbun. The original article was published Oct. 3.